All your Scouting needs in one convenient location! 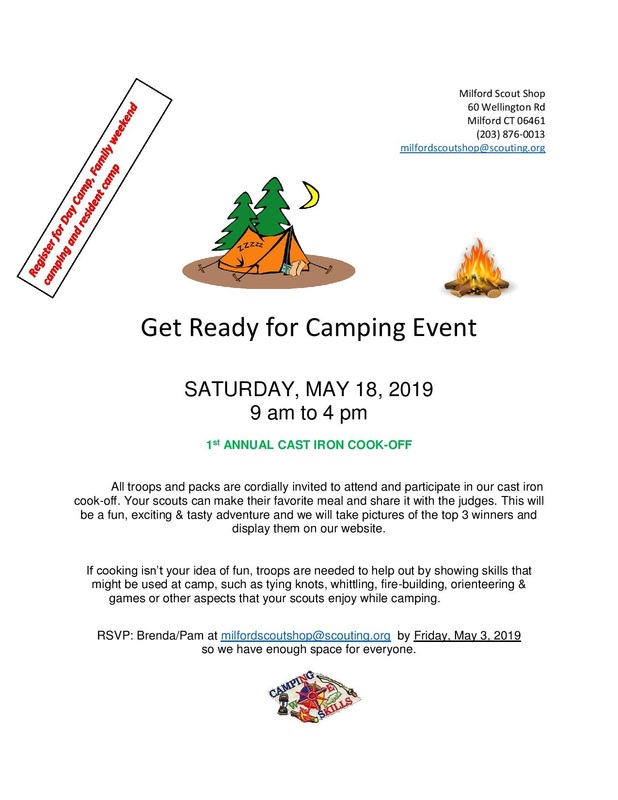 Visit our Scout Shop located at the Council Resource Center, 60 Wellington Road in Milford, for all your program needs. Uniforms, advancement badges, youth and adult handbooks, meeting support materials, craft kits, gifts, and camping supplies. It’s all available at your local Scout Shop. New Year’s Day, Memorial Day, Independence Day, Labor Day, Thanksgiving Day, Black Friday, Christmas Eve and Christmas Day. 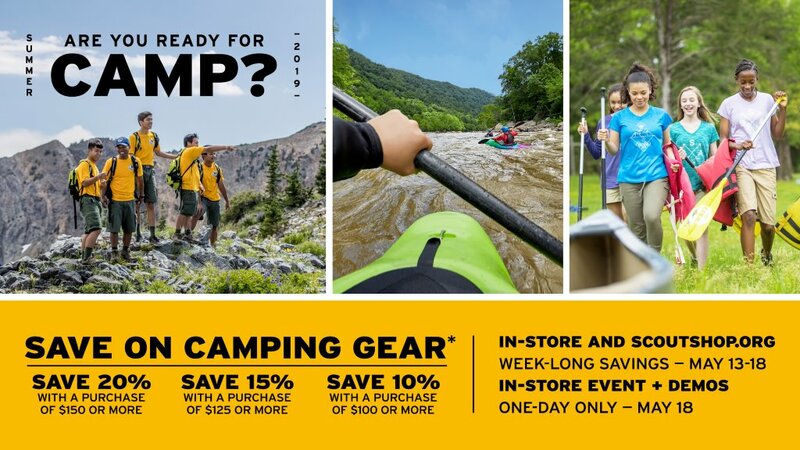 Save on camping gear May 13th through the 18th!!! Come in between April 1st through May 31st and purchase a pair of blue bottoms and get 25% off of your blue Cub Scout shirt!!!! 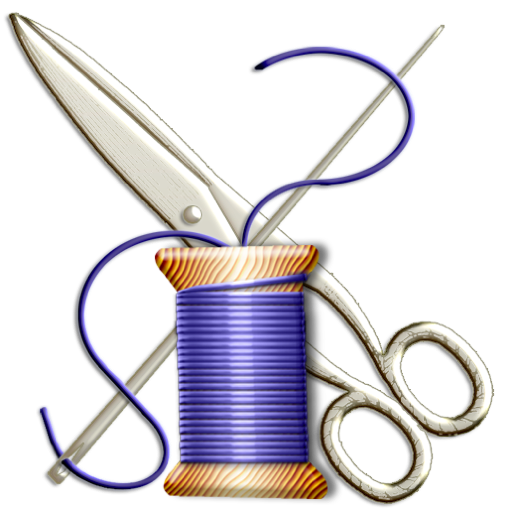 Let us do your sewing!!! •Advancement for restricted items, which are ranks and merit badges especially, requires the internet advancement form or the Scoutbook Sync form. 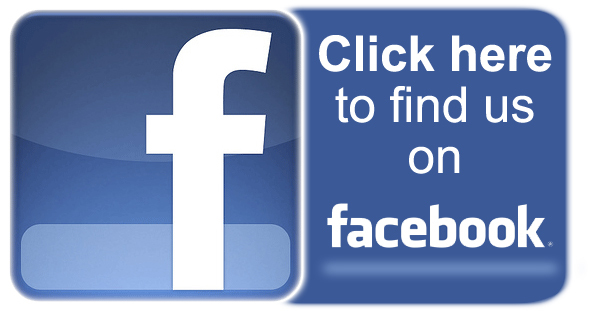 Bring in, email, or show us those forms on your phone and it will allow us to sell you those items. •** We advise units to do their advancements a few days or more before they need it in case anything needs to be resolved. Council staff that can fix your issue may not be in the office when you arrive. 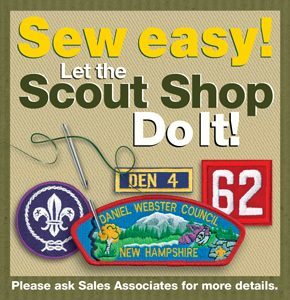 •*Parents and others wishing to buy replacements, we need to see your Scout’s recorded advancement (internet advancement form or the Scoutbook Sync form) so we may be able to sell you those items. Beginning in January, Scoutbook will become Free for all units. We anticipate a move to that advancement tracking sometime after that. Merritt Parkway (Route 15) North, to Exit 55A (wheelers Farm Road). At end of the ramp turn left (proceed under parkway). At traffic light, turn right. Entrance to complex is on the left. As you enter the business park, bear right. 60 Wellington is the last building on the left. I-95 North to Exit 38. Follow signs for Route 15 North (Wilbur Cross Parkway). Exit 55A (wheelers Farm Road). At end of the ramp turn left (proceed under parkway). At traffic light, turn right. Entrance to complex is on the left. As you enter the business park, bear right. 60 Wellington is the last building on the left. Route 15 South to Exit 55. Turn right (almost immediately) into the business park. As you enter the business park, bear right. 60 Wellington is the last building on the left. I-95 South to Exit 38. Follow signs for Route 15 North (Wilbur Cross Parkway). Exit 55A (wheelers Farm Road). At end of the ramp turn left (proceed under parkway). At traffic light, turn right. Entrance to complex is on the left. As you enter the business park, bear right. 60 Wellington is the last building on the left.